Can you guess what "bedroom" is called in Burmese? The Burmese word for bedroom doesn't contain the word "bed" at all. In direct translation, it is called "sleep room". ate khan3 means bedroom, where ate means "to sleep", and khan3 refers to a room. But, don't worry. I can guarantee you, all hotels, and even low budget "guest houses" in Myanmar will have a bed for you to sleep on. 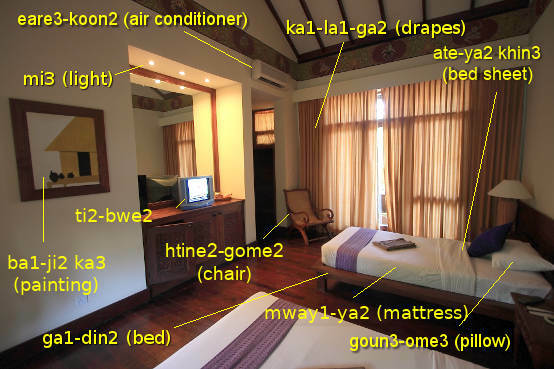 Below is the photo of one quite decent hotel room in Myanmar and some new vocabularies. Here's another good news. Most decent hotels in Myanmar will have someone who knows some English, so they should be able to understand what a bedroom with bathroom attached means. But, if you want to show off your Burmese speaking skills, I can help you a bit on that area. yay2-cho3 khan3 pa2 deare1 a-khan3 lo2 chin2 deare2 -- I want a room with bathroom attached. yay2-cho3 khan3 neare1 a-khan3 lo2 chin2 deare2 -- I want a room with bathroom attached. 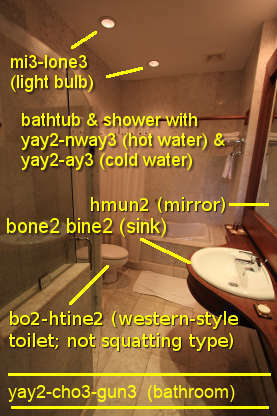 Of course, you can always substitute bathroom with some other nouns such as eare3 koon2 (air-conditioner), mini-bar, IDD phone, Internet connection, and so on. beare2 hna1 xxxx yyyy, where xxxx is the measure word and yyyy is needed to complete the sentence. Measure word xxxx examples are shown below without yyyy. Those are not complete sentences yet. beare2 hna1 lone3 -- "how many" for items with round shapes such as fruits and light bulbs. Extensive list of "measure words" are given in the table at the left column of lesson 12. Myanmar Grammar Notes: Question word beare2 hna1 is a pronoun if there is no mention of the noun. If it has a noun in front, it will be adjective. E.g., lu2 beare2 hna1 yout la2 leare3 -- How many people came? Now, you need yyyy ending part to complete the sentence. There can be several variations, but I will give two common usages. lo2 chin2 leare3 -- used in "how many do you want?" leare3 -- just a question mark in "how many xxxx" sentence. Examples on full sentences with the format: "How many xxxx yyyy? beare2 hna1 khan3 lo2 chin2 leare3 -- How many rooms do you want? beare2 hna1 yout leare3 -- How many persons? beare2 hna1 lone3 lo2 chin2 leare3 -- How many (fruits, light bulbs, etc..) do you want? eare3-koon2 pyet nay2 deare2 -- air conditioner + "not in working condition"
ka3 pyet nay2 deare2 -- car + "not in working condition"
set pyet nay2 deare2 -- machine + "not in working condition"
If something doesn't work that has to do with water or electricity, Burmese people will say, ma1 la2 bu3, which in direct translation means, "doesn't come". mi3 ma1 la2 bu3 -- There's no electricity! eare3-koon2 ma1 la2 bu3 -- Air conditioner doesn't work! Murphy's Law says: if something can go wrong, it will go wrong. I hope that if you plan on visiting Myanmar, Murphy's Law doesn't apply. In any case, sleep well and have no fear! Knowing some of those Burmese words to express yourself will "work" wonders. May you not encounter Murphy's Law today!